When Yoel Wazana was in high school in Palmdale, Calif. he had a Camaro Z/28 that did 11.80 in the quarter mile at Palmdale’s L.A. County Raceway. That may be all you need to know about Yoel Wazana. That resume certainly ticks all of the necessary food groups for a successful childhood, if you ask us. “It was a fun time to be there,” he said of his racing days in the High Desert, back when a fast-food paycheck could buy a kid an Edelbrock manifold and a couple tenths in the traps, back before they closed LACR and the world got a little less interesting and the possibilities a little more stunted, back when a young guy with initiative could do something other than study day and night for two years just to gain a point on his pre-pre-pre-SATs. That time at the drags would have been enough for many car enthusiasts, providing a lifetime of stories that fall into the category, “The older I get, the faster I was.” Perhaps you know one of those guys. But Wazana was driven by a strong business acumen, too. In 1994 at the tender age of 21 he started a business in his garage refilling ink and toner cartridges and selling them to businesses. That business eventually grew to be MSE, “…a global leader in high-quality aftermarket imaging consumables.” Not too long ago he sold that business and put the profits into another promising and way more intriguing venture, Fusion Luxury Motors. 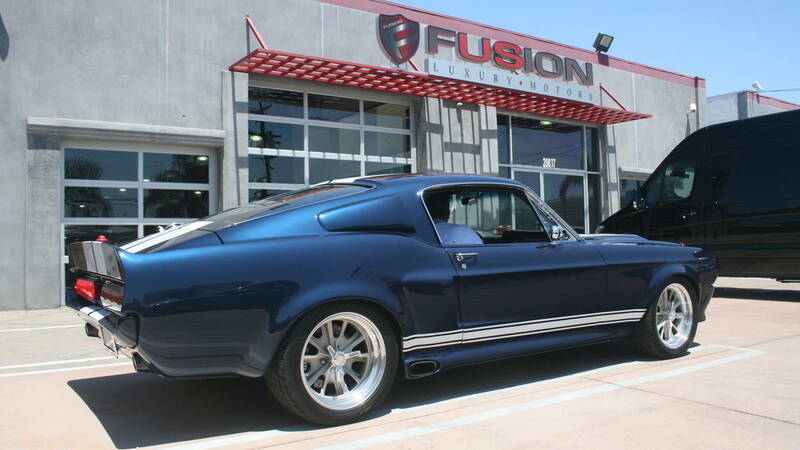 Fusion buys and sells high-end supercars, classic performance cars and, now, remakes classic cars into modern-tech performance machines. Specifically, and the reason we visited, Fusion Luxury Motors makes Eleanors. 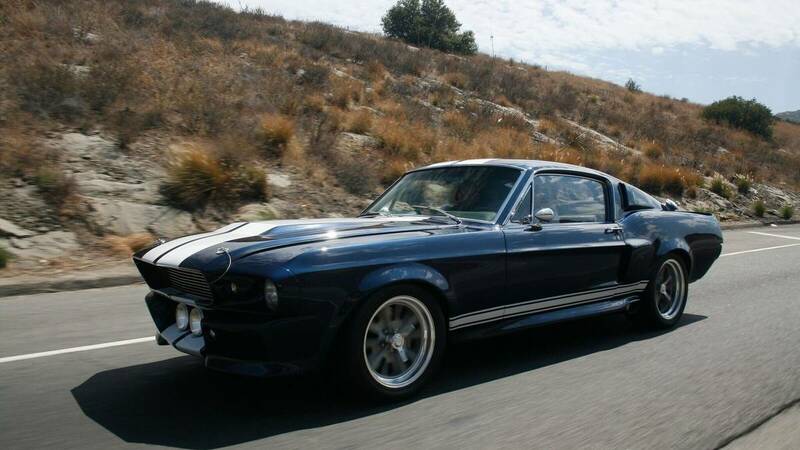 You may have seen one of the two “Gone in 60 Seconds” movies, either the original way back in 1974 or the more recent version starring Nicholas Cage. And while car-guy and car-collector Cage was listed as the star of the latter movie, for many an equally big draw was the Mustang driven by H.B. Halicki in 1974 and Cage in 2000: Eleanor. Why does that car mean so much to so many? 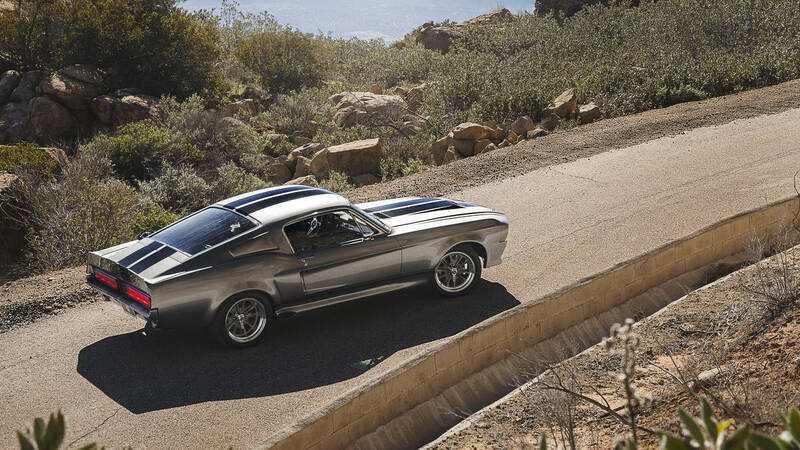 Why have there been companies come and go over the years claiming to make dead-nuts-original, just-like-the-movie Mustangs in Eleanor regalia and selling them for outrageous six-figure sums? Maybe it’s the rebel spirit of the characters who drove them on the silver screen. Sure, they were car thieves, something we don’t encourage or condone. But it’s what such a car and such a driver represents – an erstwhile celluloid hero running stoplights, jumping barricades and crashing through plate glass windows without a scratch. He is doing all the things up there on the screen that we all wish we could do in real life but can’t. At least without getting arrested and thrown in jail. And what is the vehicle that grants him all this freedom and power? Eleanor. By this time Fusion was big into supercar sales. Wazana listed a number of famous clients, all of whom you know but none of whom we will name here because Wazana also offers discretion among the deals. On the day we visited, the showroom of Fusion Luxury Motors was awash with wheeled splendor: a McLaren 675 LT Spider,Porsche 918, Ferrari 488 GTB, Ferrari F12, Bugatti Veyron, Koenigsegg CCXR Trevita, Mercedes McLaren SLR, aP1, more Ford GTs, a 911 GT2, a BMW Z8 Alpina, various Lamborghinis, among the modern cars. Classics abounded, too: a 1961 Jaguar E-Type, 1953 Ferrari 250 Europa, two 1970 Plymouth ‘Cudas, two 1959 Porsche 356s, a couple Ferrari 365 GTB/4 Daytonas, and more. They are priced so that when one of those famous names walks in and wants to buy something on impulse, not only will there be impulsive cars around, but they will be priced so that Fusion might make a small profit off them. That philosophy is also applied to the Eleanors, of which they’d made six as of the date of our visit. In the shop they make giant X-shaped cross-members that reinforce the chassis. 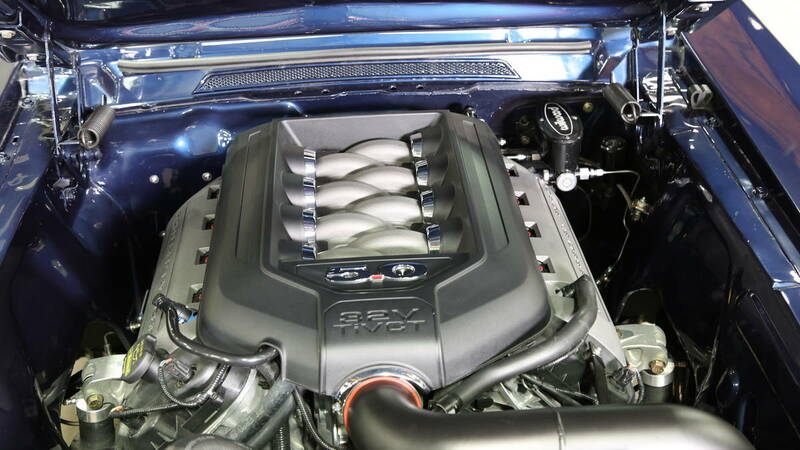 The powertrain can vary but the Eleanor we saw under construction had a fuel-injected Roush 427 IRN 8-Stack that made 560 hp and 540 lb-ft of torque mated to a Tremec five-speed manual with hydraulic clutch. You can also order a 480-hp Roush 427 SRXE, 750-hp Roush fuel-injected supercharged V8, or a 430-hp Roush 5.0 Coyote. In addition to the Tremec five-speed you can order a Tremec six-speed manual with double hydraulic clutch or you can just get an automatic. The suspension on the car under construction was by Detroit Speed, featuring coilover front suspension and a four-link rear. Brakes were Wilwood with the word “Eleanor” on the calipers. 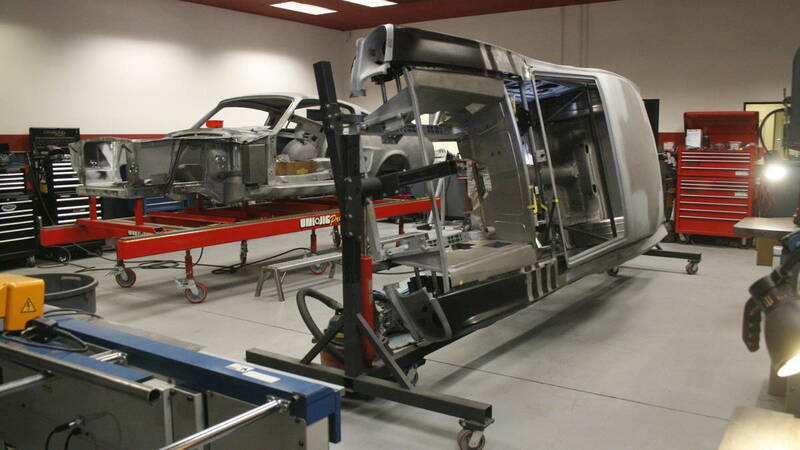 The body and frame are powdercoated and inside is what is listed as a “cosmetic” rollbar. The bodies are all either 1967 or ’68 Mustang Fastbacks and they’re slathered inside with layers of Dynaliner and Dynamat sound insulation. And, of course, there’s a plaque that reads, “Gone in 60 Seconds.” In case you thought it was the Hello Kitty Mustang or something. Fusion has employees from such SoCal crafts shops as Five Axis and Metalcrafters, among other sources. The Eleanors are officially licensed by Denise Halicki, widow of original “Gone in 60 Seconds” producer and star H.B. Toby Halicki. Denise Halicki granted Fusion the exclusive global license to produce Eleanors. “She has been a huge supporter,” said Wazana. So it’s all as good as an Eleanor could be. Or so we would see. Out in front of the showroom was a blue Eleanor with white stripes. It had the 450-hp version of the 5.0-liter Ford Coyote V8 mated to the Tremec TKO five-speed manual, Detroit Speed front suspension/subframe, Currie 9-inch rear end, Wilwood brakes, 245/45-17, 275/45-17 (f/r) Nitto NT555s, and what Fusion calls the “base” interior with the non-Recaro seats. The interior will take you right back to 1968: the flat “bucket” seats, the single lap belt, the skinny wooden steering wheel, the intrusively long shifter, the wide, drilled pedals. You can almost hear the Beach Boys singing. Then you fire that sucker up. Whapoooze it starts, taunting you to gun it. Which, of course, you do. Whirapeeeed diddy dap. You can picture the entire valvetrain marching in frenzied lock step to the crazed rhythm of the crank. Ah yes, we remember this. Underway, the suspension is firm but not too firm. That skinny steering wheel is really skinny. The rack and pinion power steering itself feels overboosted compared to a modern car, but you’re not in a modern car, you’re back in 1968. The long throw of the shifter also brings you back a few decades, as does the long clutch pedal travel. They all immediately remind you of how much more precise a modern sports car is, but at the same time remind you of how much fun an old muscle car can be. 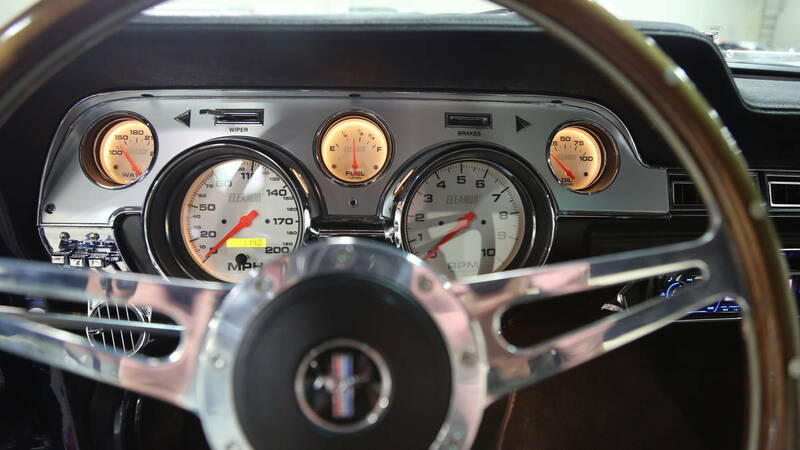 The parking brake on our Eleanor wasn’t off all the way, even though the lever was flat to the floor (“We need to adjust that,” Wazana said.) There were a few squeaks from the shifter and from somewhere in the back of the car. They would all be addressed, Wazana said. This was what a muscle car was meant for –- two guys cruising the Valley looking for a race.Whompwhomwhomp went the cams then, Whaaaaaaaaaaa when we floored the gas. It was a crazy cacophony of combustion. So much power. Was there a bracket race at the local drag strip tonight? Was there even a local drag strip anymore? The old San Fernando Drag Strip was long gone. LACR was long gone. Hey, Irwindale still has Thursday night drags! But no, we had to have it back. But not before taking it on a twisting bit of hilly pass way out at the west end of The Valley. Here the ‘Stang, like any old and authentic muscle car, was a little out of its element. Despite the much-improved suspension and tires, it still plowed around through the corners. But it did that in a way that fully involved the driver. You had to pay attention to the slip of the fronts and not over-gun the gas to keep the rears in line. It was 450 hp, after all, and no waiting. Sure it was loud and kind of rattly, but this is a time machine that takes you back 50 years. If you’d had this car in this trim in 1966 you’d rule the school. As it is, you can still get lots of thumbs up from all kinds of drivers who recognize and appreciate a truly beautiful piece of American history. I would be perfectly willing to put those 30,000 miles on this one, Mr. Wazana. Oh yeah.